FILE - In this Feb. 20, 2014 file photo, a customer exhales vapor from an e-cigarette at a store in New York. Erika Sward is with the American Lung Association, which has called on the FDA to remove all flavored e-cigarettes from the market. Sward said the FDA’s decision to leave out menthol and mint flavors is a mistake. Studies show those flavors are used by nearly half of teenagers who vape. But now, under the agency’s new rules, that date will move to 2021. A separate proposal announced last Wednesday aims to ban flavored cigars that were launched after 2007. That is the effective date for many of FDA’s legal powers. Cigars come in flavors like blueberry, cherry and chocolate. 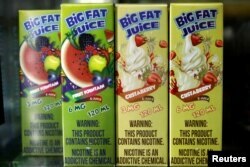 Lawmakers worry teenagers could turn to these tobacco products as flavored e-cigarettes are restricted. We want to hear from you. 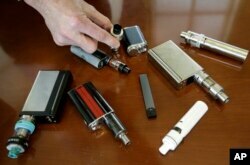 How common is the use of e-cigarettes among young people in your country? Write to us in the Comments Section or on our Facebook page.